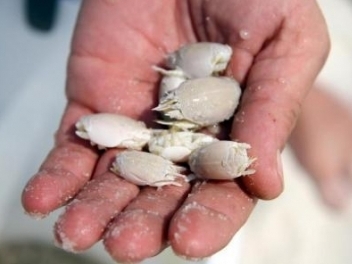 Mole crabs are used for catching pompano in the surf or from nearby fishing piers. They can be caught by hand or with specialized rakes or scoops which have a mesh liner. When available, crabs that have recently shed their shell are preferred for use as bait. Mole crabs should be kept alive until used for bait by placing them in a bucket of water and storing them out of the sun. Although they are best known as a pompano bait, mole crabs also catch croaker, spot, kingfish, seatrout, striped bass, flounder, and other species that are found in the wash. Like other small crabs, they are sometimes gathered and used as bait for catching tautog, black sea bass, sheepshead, and other fish around rocks, reefs, or other structure.